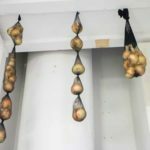 How To Store Onions Using Pantyhose - Easy and Cheap Trick! Thanks for the comment Rick, those are great ideas! How To Store Onions Using Pantyhose. This is a great and cheap way to store onions to make them last for months. Follow these step by step instructions! Pantyhose is a funny word. Does anyone still use the word? I usually call them tights or stockings. But I decided to go brave and use the word pantyhose in the title. Pantyhose is great for making your legs look good. They’re also great for storing onions. Who knew, right? In my search for the perfect way to store onions many recommendations are often given for mesh bags. I never have mesh bags though and I don’t want to buy any, so I got to thinking…. mesh makes things breathe easier, but what else does? Pantyhose! Pantyhose is usually made of nylon making your legs able to breathe through them. 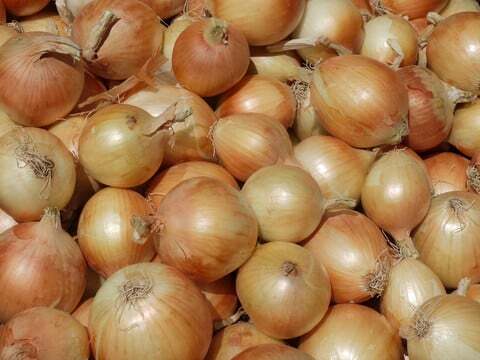 Substitute your legs with onions and now you got some onions that can breathe too! So let’s get to how to store your onions, alright? How To Store Onions Using Pantyhose. First, pick your onions and let them dry. We separate them so they aren’t touching and let them dry on the roof for a few days. If you let them dry outside, make sure you check the weather so that it will not rain. Moisture is your worst enemy when drying and storing onions so the point is to dry them. After they have dried in the sun for a few days, use your hand to gently brush off any dirt on them. This will help make sure nothing is left on them that will make them spoil. Now, bring them indoors. Next you want to cut the stem to about 1 inch for each onion. Now grab your pair of pantyhose and cut them apart so you have both legs separately. Now you want to store dropping the onions into them. It’s best if you tie each large onion apart so no onions are touching each other. This will prevent them from spoiling one another if one goes bad. It also will allow you to take one onion out a time, as you will cut one out. You can see in this picture how we tied them to separate them. 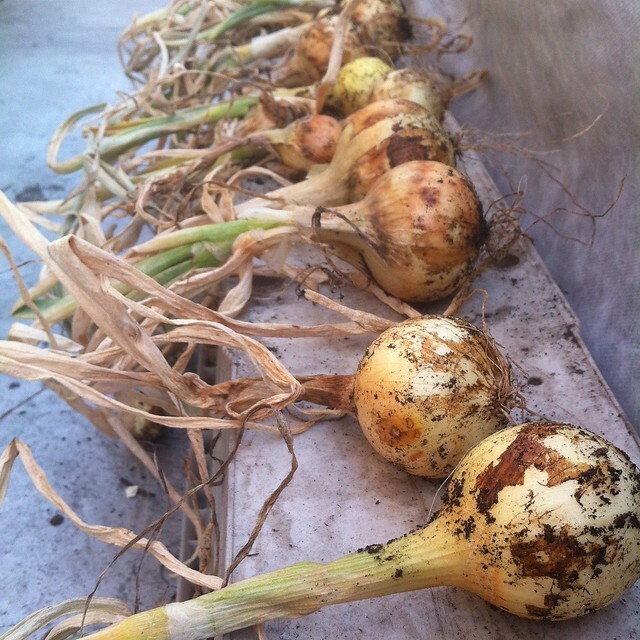 For smaller onions, we put them together as we know we’ll be using a bunch at once. You can cut your pantyhose as much as you want to give you as much onion storage as possible. This is only using one pair of pantyhose but we cut them up into 3 pieces. 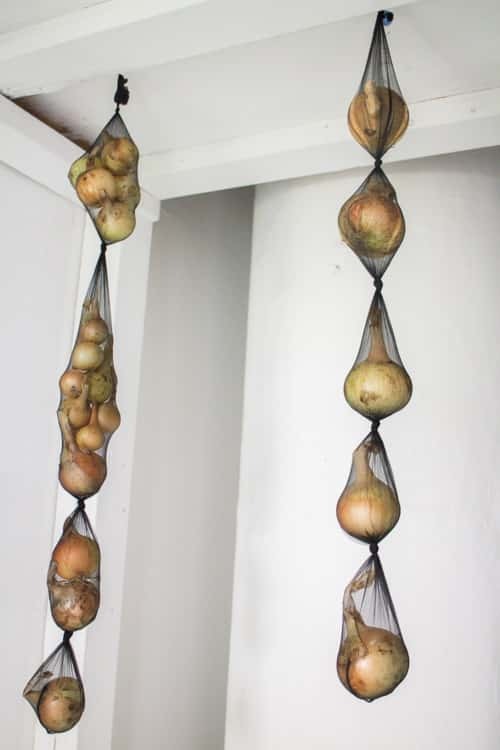 And there you have it, a easy and great way to store your onions to last you for months! Follow my Facebook Page for more gardening tips! First, pick your onions and let them dry. We separate them so they aren't touching and let them dry on the roof for a few days. If you let them dry outside, make sure you check the weather so that it will not rain. Now grab your pair of pantyhose and cut them apart so you have both legs separately. Now you want to store dropping the onions into them. It’s best if you tie each large onion apart so no onions are touching each other. This will prevent them from spoiling one another if one goes bad. It also will allow you to take one onion out a time, as you will cut one out. Although I HATE pantyhose themselves with a passion and the word as well. I may make an exception and buy them, if my onions are successful. What a great post, Pamela! I had no idea that you could store onions using pantyhose. I’m definitely going to have to remember this for the future! What a great kitchen hack (that’s a funny word, to!) 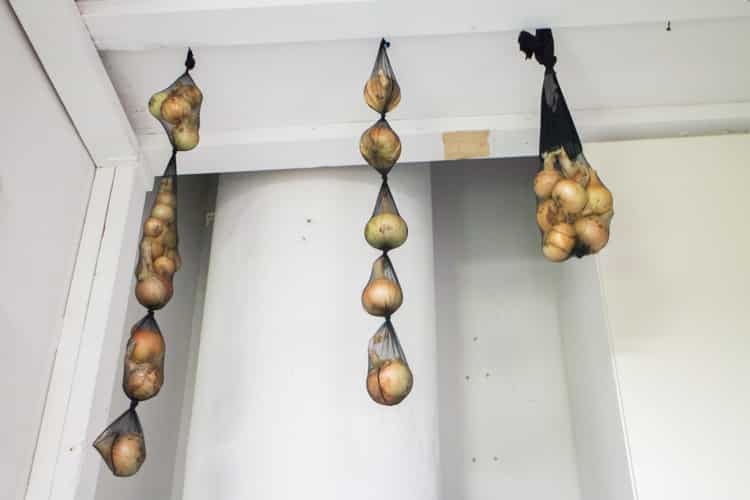 I adore onions, and this seems like a very sensible solution for storing them, thanks. They kind of look like modern art sculptures hanging there, too! This is such a terrific tip! I need to keep a closer eye on my onions as there always seems to be one escaping my vision that starts to spoil! Thanks! That’s a very helpful tip, Pamela. Pamela – you are a genius – I would never have thunk to use pantyhose to store onions! “Substitute your legs with onions” – cracked me up! Brilliant idea Pamela! great post. 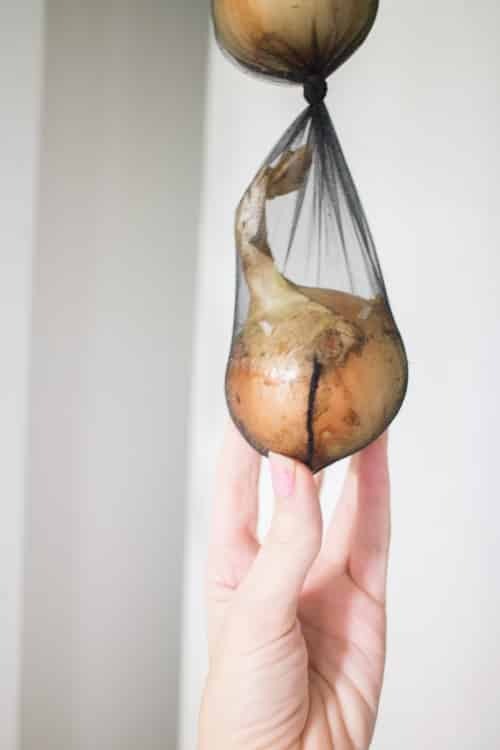 Pantyhose for storing onions??? Who knew? Great idea Pamela, hate to wear pantyhose have a bunch of unused pairs now I have a use for them. Very cool. This is such a hilarious, but good idea!! So smart!! 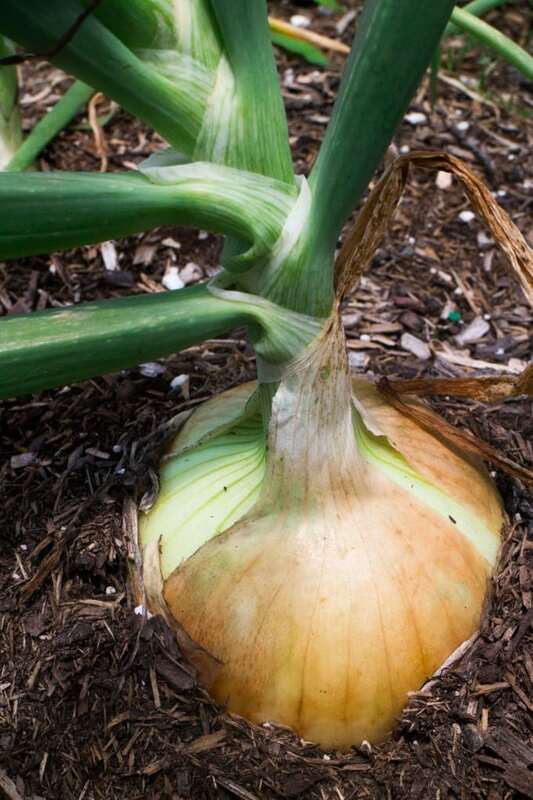 Am I too late to do Fall onions? Hey Jamie, you could always plant over the Winter and then just pick them in the late Spring. To do this you’ll need to protect with a greenhouse or cover them with mulch to lock in warmness. 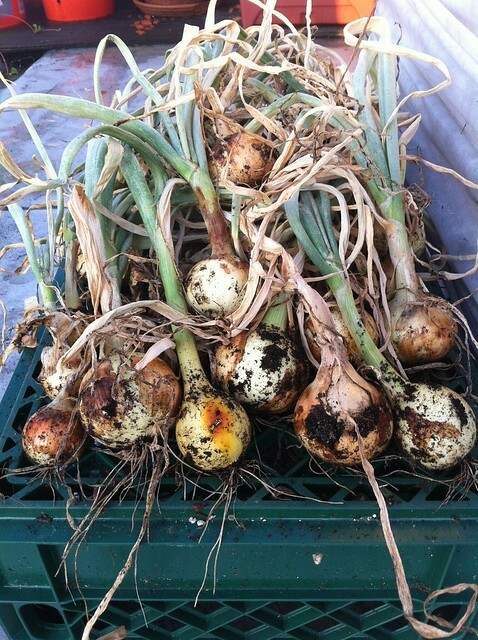 Last year we had pretty good success growing them over Winter and we had a harsh few months! This is too funny, and a great idea!! 1) No, I don’t call them pantyhose. Tights. Leggins. Not pantyhose. I feel gross even typing it! 2) I am so happy to have found this tip! I constantly throw onions away because I buy them but don’t store them properly. Now I know! Yay!! No more yucky onions!!!! Lucky me, I no longer have to wear pantyhose for work…. 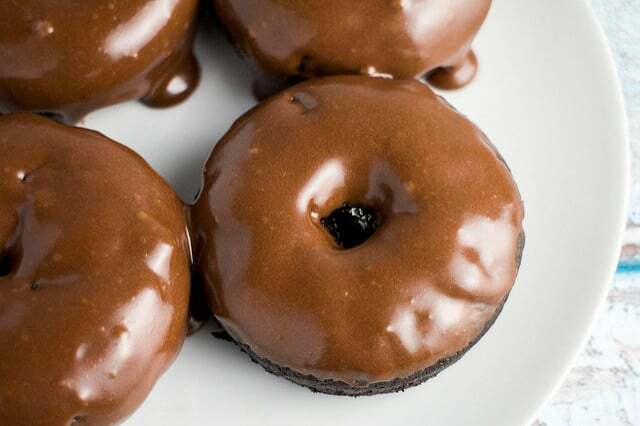 so they are going to my Vidalias! You can also buy onion sleeves from Dixoondale Farms. They are $1.50 each for a 15 ft. or so sleeve. I use small plastic zip ties between each onion. When you need an onion, simply cut the bottom zip ties & remove the onion. Save the empty sleeves & use them over for the next year. 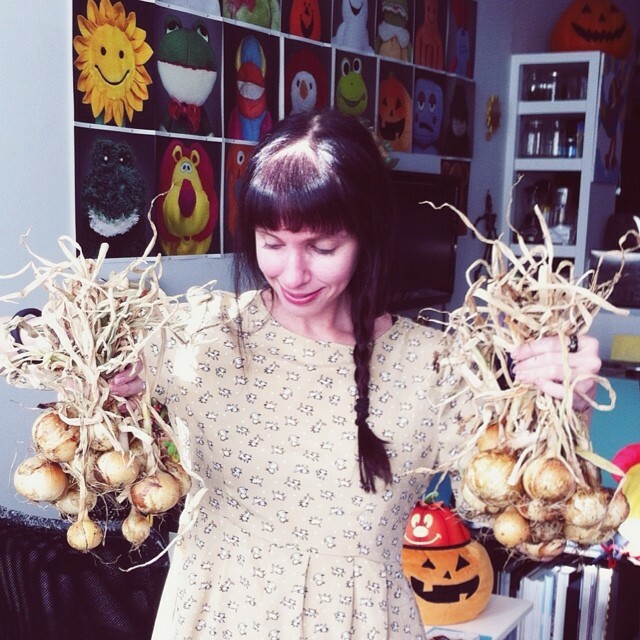 My Candy onions will usually last in these sleeves hung in my basement from July to March or April.